"If I lose tomorrow my son is going to be not too happy. He's here with me and he gets upset when daddy loses races. 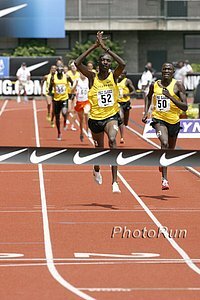 I lost in New York and he could not believe that I lost, and when I broke the American record in the 5,000 I finished third and he wasn't too happy, so there's more motivation for me to run and win for my son as well." - Bernard Lagat on the Bowerman Mile he's running on Saturday. 16 year old kids run 3 48! Why is gold considered a safe haven investment? iResults: New App Lets You Get Your iTime Instantaneously From Finish Line Volunteers Or iFamily iResults: They wait 30 minutes for you to finish the 5k ... you get your results immediately. 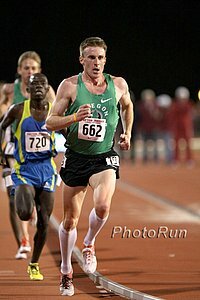 LRC Guest Editorial: "Moving The Needle - Let's Take A Step Forward" LetsRun.com employee 1.1 writes a brilliant piece and tells the LRC faithful that it's time to stop complaining and start supporting T&F. From Des Moines: Even Meet Director Says He Was Disappointed By Fan Turnout Interestingly enough, the attendance in Des Moines was bigger than in Eugene. It's just that the stadium in Eugene is tiny. With Many Stars On Sidelines, Dwain Chambers Steals The Show Chambers won the 100 as Christine Ohuruogu and Jessica Ennis sat on the sidelines. Even Jenny Meadows was forced to pull out of the 800 final to nurse a tight hamstring. Kenya: Kenyan Trials For African Championships Conclude - Janeth Jepkosgei (1:58.95) And David Rushida (1:44.23) Dominate 800s Richard Mateelong (steeple) and Vivian Cheruiyot (5,000) were other notable winners. Trinidad & Tobago: Olymipc 100 Silver Medallist Richard Thompson Scores Double At Trinidad & Tobago Champs Thompson captured the 200 for the first time as he ran a championship record of 20.37 to beat NCAA champion Rondel Sorrillo (20.62) and World Championships 400m bronze medallist Renny Quow (20.79). Kelly-Ann Baptiste broke 11.00 in the ladies champs.